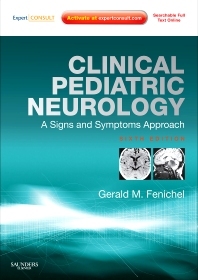 Clinical Pediatric Neurology, 6th Edition, by Gerald M. Fenichel, MD, offers you highly practical assistance in diagnosing and managing the primary neurologic disorders of childhood. Simply look up the presenting symptoms, and you'll be guided step by step through evaluation and management! Thorough coverage for each neurological disease clearly defines age at onset, course of illness, clinical features, and treatment options. Differential diagnosis tables and treatment algorithms expedite clinical decision making. And now, you can also rapidly consult the book from any computer at expertconsult.com! Thorough coverage for each neurological disease clearly defines age at onset, course of illness, clinical features, and treatment options. Differential diagnosis tables and treatment algorithms lead you through the evaluation and management of even the most difficult neurodegenerative disorders, including those caused by inborn errors of metabolism. An organization by body system, together with a user-friendly, highly templated format, makes reference quick and easy.